Can you make it off the Red Planet? Located in the Berry Hill neighborhood of Nashville, The Escape Game offers an escape from ordinary life and allows you to live the stories you love. Here’s how it works: You and your team are locked in a room and have one hour to complete a mission and escape. Escaping will require teamwork, quick thinking, determination and a sense of urgency! In Mission: Mars, you've landed on Mars, but your ship's oxygen, power and communication systems are down. Can you repair the ship before the solar flare hits? Located at 510 East Iris Drive in the Berry Hill neighborhood of Nashville, please check in 15-minutes prior to your game start time. 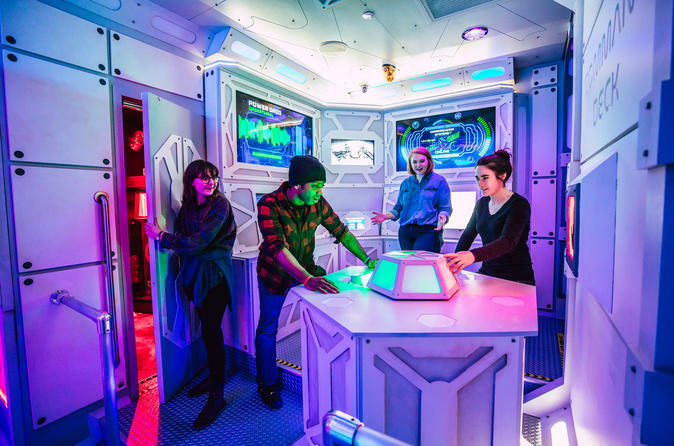 Our Mission: Mars Escape Room is an exciting, immersive game that takes you out of this world. You’ve just landed on the red planet for an exploratory mission, but your spacecraft experienced some major damage on the descent. Unfortunately, there is a larger problem at hand: a large fatal amount of cosmic radiation is heading towards Mars, which will cause serious damage to the control systems, making it impossible to get back home. You have exactly 60 minutes to repair your ship and launch if you ever want to see Earth again.